Below are 114 timeless quotes by Socrates. His ideology is exemplified by his students, Plato and Xenophon , through their writings and dialogues. Quotes are sorted by increasing length count in characters and are not ranked in order of popularity. 002. To be is to do. 003. Be as you wish to seem. 004. Wisdom begins in wonder. 005. Be true to thine own self. 006. Envy is the ulcer of the soul. 007. Beauty is a short-lived tyranny. 008. An honest man is always a child. 009. Wonder is the beginning of wisdom. 010. Through your rags I see your vanity. 011. To find yourself, think for yourself. 012. The hottest love has the coldest end. 013. Beware the barrenness of a busy life. 014. There is no solution; seek it lovingly. 015. 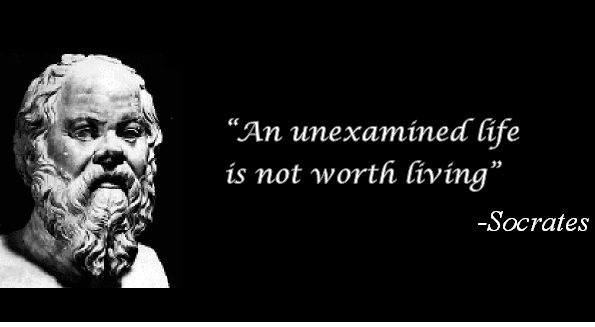 The unexamined life is not worth living. 016. To move the world we must move ourselves. 017. May the inward and outward man be as one. 018. Understanding a question is half an answer. 019. Thou shouldst eat to live; not live to eat. 020. To know thyself is the beginning of wisdom. 021. Every action has its pleasures and its price. 022. The misuse of language induces evil in the soul. 023. The poets are only the interpreters of the Gods. 024. Death may be the greatest of all human blessings. 025. Not life, but good life, is to be chiefly valued. 026. The mind is everything; what you think you become. 027. It is not living that matters, but living rightly. 028. I pray Thee, O God, that I may be beautiful within. 029. Once made equal to man, woman becomes his superior. 030. The beginning of wisdom is the definition of terms. 031. Let him who would move the world first move himself. 032. Let him that would move the world first move himself. 033. We cannot live better than in seeking to become better. 034. From the deepest desires often come the deadliest hate. 035. 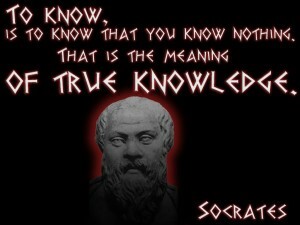 True knowledge exists in knowing that you know nothing. 036. Be kind, for everyone you meet is fighting a hard battle. 037. Living well and beautifully and justly are all one thing. 038. The only good is knowledge and the only evil is ignorance. 039. I was really too honest a man to be a politician and live. 040. There is only one good, knowledge, and one evil, ignorance. 041. I cannot teach anybody anything. I can only make them think. 042. Contentment is natural wealth, luxury is artificial poverty. 043. I am not an Athenian or a Greek, but a citizen of the world. 044. Do not do to others what angers you if done to you by others. 045. When the debate is lost, slander becomes the tool of the loser. 046. It is better to change an opinion than to persist in a wrong one. 047. Education is the kindling of a flame, not the filling of a vessel. 048. Beauty is the bait which with delight allures man to enlarge his kind. 049. There is no greater evil one can suffer than to hate reasonable discourse. 050. Prefer knowledge to wealth, for the one is transitory, the other perpetual. 051. The end of life is to be like God, and the soul following God will be like Him. 052. Give me beauty in the inward soul; may the outward and the inward man be at one. 053. False words are not only evil in themselves, but they infect the soul with evil. 054. Be slow to fall into friendship, but when you are in, continue firm and constant. 055. The way to gain a good reputation is to endeavor to be what you desire to appear. 056. He is richest who is content with the least, for content is the wealth of nature. 057. The greatest way to live with honor in this world is to be what we pretend to be. 058. The greatest way to live with honour in this world is to be what we pretend to be. 059. He is not only idle who does nothing, but he is idle who might be better employed. 060. Be slow to fall into friendship; but when thou art in, continue firm and constant. 061. 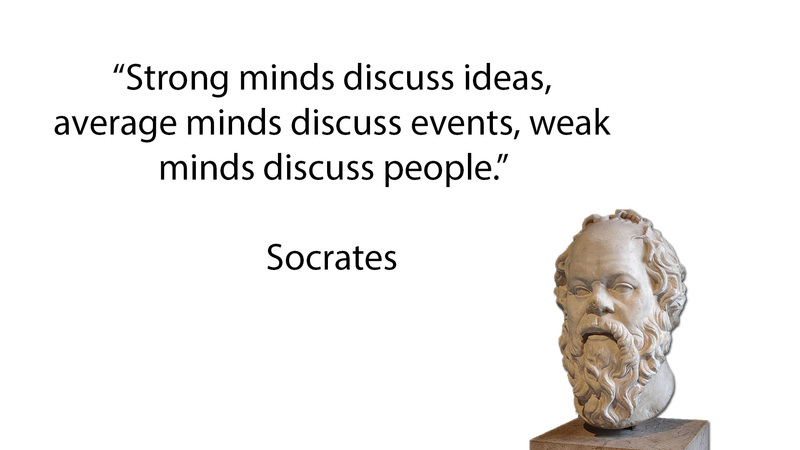 Strong minds discuss ideas, average minds discuss events, weak minds discuss people. 062. All men’s souls are immortal, but the souls of the righteous are immortal and divine. 063. Be nicer than necessary to everyone you meet. Everyone is fighting some kind of battle. 064. Our prayers should be for blessings in general, for God knows best what is good for us. 065. The greatest blessing granted to mankind come by way of madness, which is a divine gift. 066. Worthless people live only to eat and drink; people of worth eat and drink only to live. 067. The easiest and noblest way is not to be crushing others, but to be improving yourselves. 068. What screws us up the most in life is the picture in our head of what it’s supposed to be. 069. As to marriage or celibacy, let a man take which course he will, he will be sure to repent. 070. If a man is proud of his wealth, he should not be praised until it is known how he employs it. 071. In all of us, even in good men, there is a lawless wild-beast nature, which peers out in sleep. 072. Life contains but two tragedies. One is not to get your heart’s desire; the other is to get it. 073. When you want wisdom and insight as badly as you want to breathe, it is then you shall have it. 074. He who is not contented with what he has, would not be contented with what he would like to have. 075. He who is not contended with what he has, would not be contended with what he would like to have. 076. Sometimes you put walls up not to keep people out, but to see who cares enough to break them down. 077. He is a man of courage who does not run away, but remains at his post and fights against the enemy. 078. If you want to be a good saddler, saddle the worst horse; for if you can tame one, you can tame all. 079. The secret of change is to focus all of your energy, not on fighting the old, but on building the new. 080. Think not those faithful who praise all thy words and actions; but those who kindly reprove thy faults. 081. The secret to happiness, you see, is not in gaining more, but in developing the capacity to enjoy less. 082. One should never do wrong in return, nor mistreat any man, no matter how one has been mistreated by him. 083. To express oneself badly is not only faulty as far as the language goes, but does some harm to the soul. 084. I know you won’t believe me, but the highest form of Human Excellence is to question oneself and others. 085. The secret of happiness, you see, is not found in seeking more, but in developing the capacity to enjoy less. 086. The highest realms of thought are impossible to reach without first attaining an understanding of compassion. 087. Children nowadays are tyrants. They contradict their parents, gobble their food, and tyrannise their teachers. 088. My advice to you is get married: if you find a good wife you’ll be happy; if not, you’ll become a philosopher. 089. By all means marry; if you get a good wife, you’ll become happy; if you get a bad one, you’ll become a philosopher. 090. Virtue does not come from wealth, but. . . wealth, and every other good thing which men have. . . comes from virtue. 091. By all means, marry. If you get a good wife, you’ll become happy; if you get a bad one, you’ll become a philosopher. 092. We can easily forgive a child who is afraid of the dark; the real tragedy of life is when men are afraid of the light. 093. True wisdom comes to each of us when we realize how little we understand about life, ourselves, and the world around us. 094. Be of good cheer about death, and know this of a truth, that no evil can happen to a good man, either in life or after death. 095. He who is unable to live in society, or who has no need because he is sufficient for himself, must be either a beast or a god. 096. Employ your time in improving yourself by other men’s writings, so that you shall gain easily what others have labored hard for. 097. Employ your time in improving yourself by other men’s writings so that you shall come easily by what others have labored hard for. 098. I only wish that ordinary people had an unlimited capacity for doing harm; then they might have an unlimited power for doing good. 099. The hour of departure has arrived, and we go our separate ways, I to die, and you to live. Which of these two is better only God knows. 100. If all misfortunes were laid in one common heap whence everyone must take an equal portion, most people would be contented to take their own and depart. 101. If all our misfortunes were laid in one common heap whence everyone must take an equal portion, most people would be content to take their own and depart. 102. Where there is reverence there is fear, but there is not reverence everywhere that there is fear, because fear presumably has a wider extension than reverence. 103. A system of morality which is based on relative emotional values is a mere illusion, a thoroughly vulgar conception which has nothing sound in it and nothing true. 104. The really important thing is not to live, but to live well. And to live well meant, along with more enjoyable things in life, to live according to your principles. 105. No man has the right to be an amateur in the matter of physical training. It is a shame for a man to grow old without seeing the beauty and strength of which his body is capable. 106. Ordinary people seem not to realize that those who really apply themselves in the right way to philosophy are directly and of their own accord preparing themselves for dying and death. 107. One who is injured ought not to return the injury, for on no account can it be right to do an injustice; and it is not right to return an injury, or to do evil to any man, however much we have suffered from him. 108. I decided that it was not wisdom that enabled poets to write their poetry, but a kind of instinct or inspiration, such as you find in seers and prophets who deliver all their sublime messages without knowing in the least what they mean. 109. If a man comes to the door of poetry untouched by the madness of the Muses, believing that technique alone will make him a good poet, he and his sane compositions never reach perfection, but are utterly eclipsed by the performances of the inspired madman. 110. To fear death, gentlemen, is no other than to think oneself wise when one is not, to think one knows what one does not know. No one knows whether death may not be the greatest of all blessings for a man, yet men fear it as if they knew that it is the greatest of evils. 111. Our youth now love luxury. They have bad manners, contempt for authority; they show disrespect for their elders and love chatter in place of exercise; they no longer rise when elders enter the room; they contradict their parents, chatter before company; gobble up their food and tyrannize their teachers. 112. Esteemed friend, citizen of Athens, the greatest city in the world, so outstanding in both intelligence and power, aren’t you ashamed to care so much to make all the money you can, and to advance your reputation and prestige – while for truth and wisdom and the improvement of your soul you have no care or worry? 113. Regard your good name as the richest jewel you can possibly be possessed of – for credit is like fire; when once you have kindled it you may easily preserve it, but if you once extinguish it, you will find it an arduous task to rekindle it again. The way to a good reputation is to endeavor to be what you desire to appear. 114. If you don’t get what you want, you suffer; if you get what you don’t want, you suffer; even when you get exactly what you want, you still suffer because you can’t hold on to it forever. Your mind is your predicament. It wants to be free of change. Free of pain, free of the obligations of life and death. But change is law and no amount of pretending will alter that reality.